Brunia apicalis Walker comb. n.
Lithosia apicalis Walker, 1862, J. Linn. Soc. (Zool. ), 6:104. Diagnosis. The male facies is similar to that of sarawaca but the colour is slightly deeper, more rufous, and the forewing grey border is broader; there is usually no areole. The females also resemble those of sarawaca and antica but are larger, the forewings paler with a less clearly defined pale lining to the costa. The male genitalia lack the strong ventral angle to the saccular process, which is narrower and apically more thorn-like. The anellus lacks spines. The aedeagus structure and vesica ornamentation are very similar. 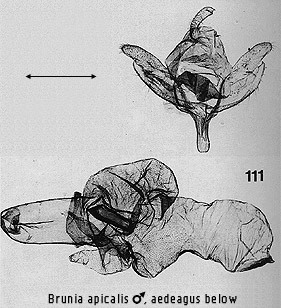 The female genitalia have the sclerotised part of the bursa narrower than the distal part, more elongate than in sarawaca, with a distinct bulge opposite the appendix. Habitat preference. The species is infrequent in forests from the lowlands to 1200m, taken particularly in those on limestone during the Mulu survey.